On Tuesday 8th May 2018, the Federal Budget 2018-19 was handed down, announcing changes to the R&D Tax Incentive based on a number of recommendations from recent reviews into the R&D Tax Incentive. While the changes outlined in the budget will not apply to R&D claims until those with income years commencing on or after 1 July 2018, the benefit and the administration processes associated with the R&D Tax Incentive are set to be significantly altered. Increased resources for administration and review of claims will result in an increase in compliance activity from both the ATO and AusIndustry to ensure the integrity of the Incentive program. At the same time Innovation and Science Australia are set to provide more effective and binding guidance on eligibility requirements. These changes also include a reduction in tax savings attributable to R&D for both small and large businesses. Currently, small businesses are entitled to a refundable tax offset of 43.5% through the R&D Tax Incentive. The changes proposed will align the benefit with the company’s tax rate for that year, with the refundable tax offset rate being the tax rate plus 13.5 percentage points. A $4 million annual cap on cash refunds will be introduced, with R&D expenditure on clinical trials being excluded from the cap. Any amount beyond the cap will be carried forward as a non-refundable tax offset. While there is clearly a reduction in the benefit, the R&D tax incentive will still provide a generous tax offset for small businesses and start-ups. Businesses with an aggregated turnover greater than $20 million will feel a greater impact from these changes. 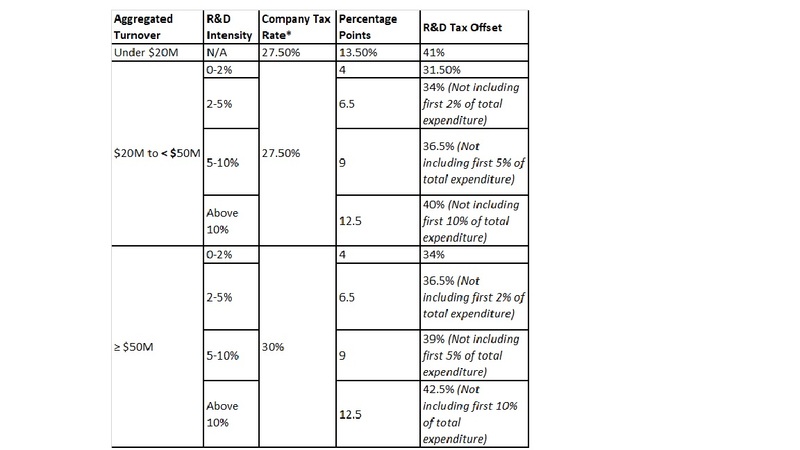 Multiple rates of R&D tax offsets ranging from company tax rate + 4% to company tax rate +12.5% will be available depending on the company’s R&D intensity. The following table and worked example demonstrate the benefits that will be available once the changes are implemented. 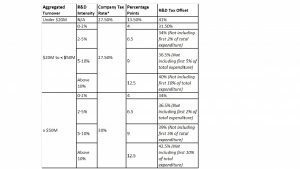 *Company Tax Rates used are based on the Enterprise Tax Plan Act. A large business with total expenditure of $100 million and $30 million R&D expenditure will have an R&D intensity of 30 percent. The first $2 million of R&D expenditure will be claimed at 34% ($680,000), the next $5 million will be claimed at 36.5% ($1,825,000), the next $10 million will be claimed at 39% ($3,900,000) and the remaining 13 million of R&D expenditure at 42.5% ($5,525000), giving a total R&D tax offset of $11,930,000.